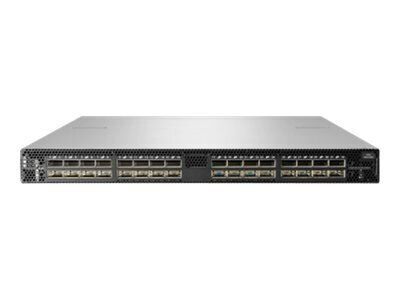 HPE StoreFabric SN2700M switches are ideal for modern server and storage networks. Supporting 10, 25, 40, 50, and 100 GbE, it delivers predictable performance and zero packet loss at line-rate across all ports and packet sizes. Optimized for storage combined with efficient design provide enterprise-level performance with attractive economics and outstanding ROI. Networks built on the HPE SN2700M are fast, reliable, and scalable while also being affordable and easily managed. They support all types of primary and secondary storage, providing consistently fair, fast, low-latency connectivity even under heavy workloads or a mix of different port speeds. This makes them ideal for storage, hyper converged, financial services, and media and entertainment deployments.